Today we are beginning our trip up the inside passage to Alaska. Our goal is to reach Glacier Bay by July 4 . We have been granted a much coveted permit to enter Glacier Bay July 5-11th. You can apply for these permits 60 days in advance. Only 13 boats are allowed in the park per day. After several days of applying precisely at 7 am and being rejected, we were finally granted a permit. Hopefully the stars will align and we will be able to reach Glacier Bay in time. It is never good to be on a schedule. 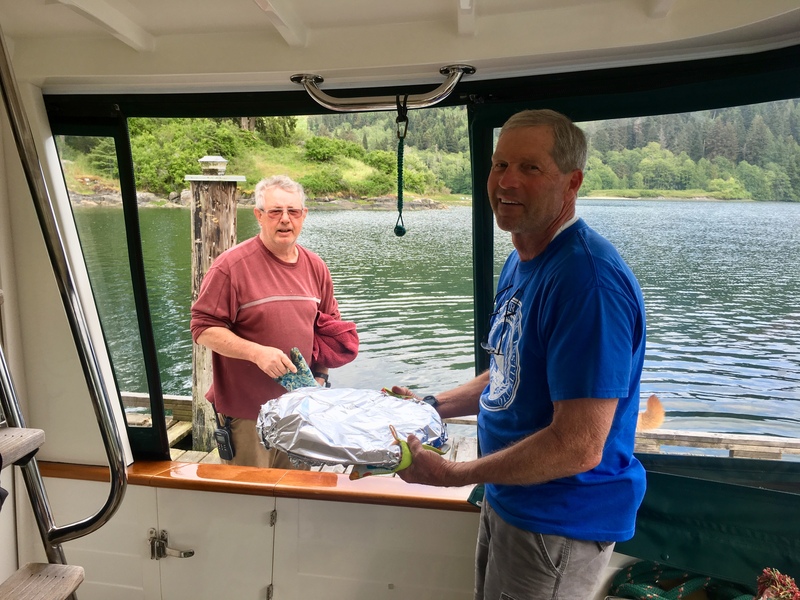 We time our departure this morning to arrive at Dodd Narrows at slack tide. The currents through this gateway run up to 9 knots. We can only traverse these waters near slack tide. Boats congregate on both sides of the Narrows waiting on slack. We go through five minutes early and the current is a non issue. 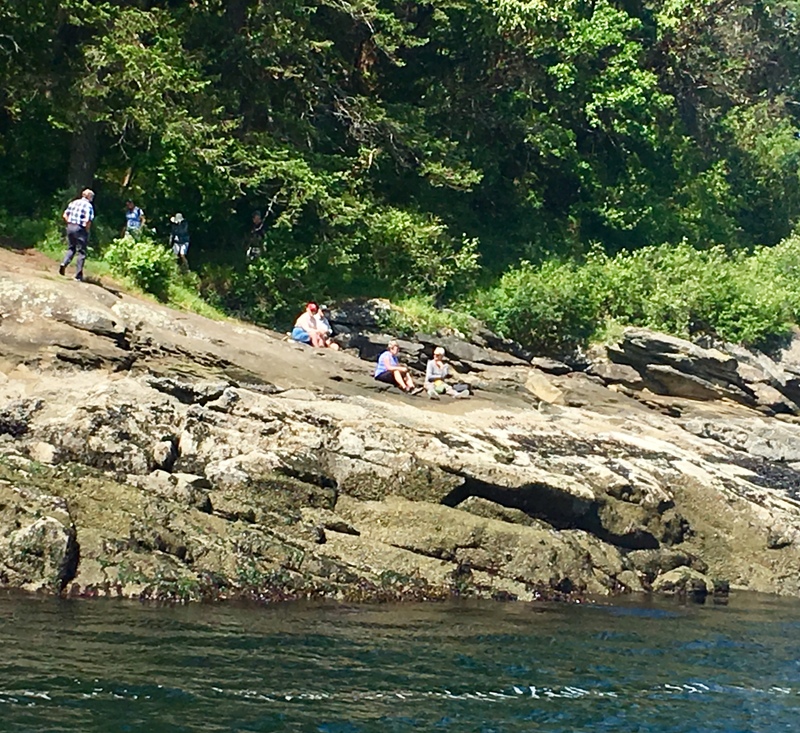 Bystanders are out on the point hoping to see boats crash and burn. 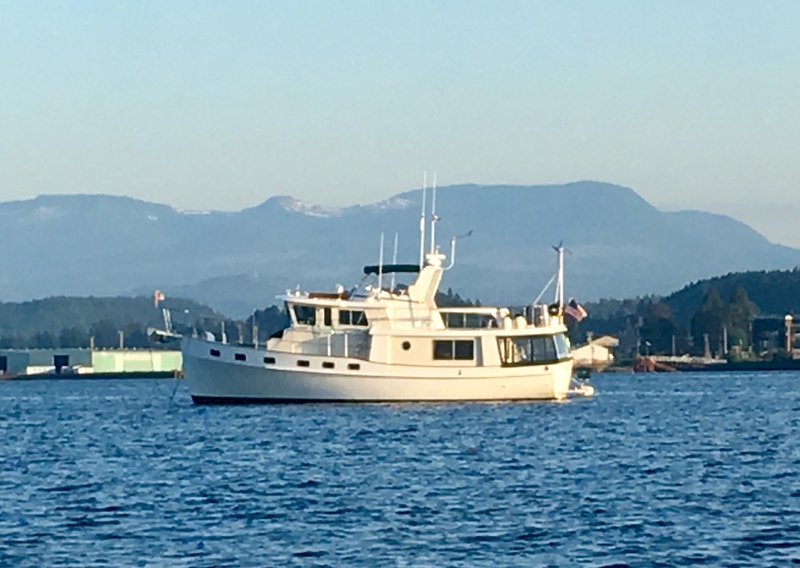 Just a few miles farther north, we drop the hook at the anchorage off New Castle Island just across from the busy port of Nanaimo. Our reason for stopping here is to drop Nate and Primo off at “Bird Camp”. Due to USDA regulations and a lack of a USDA vet in Alaska, it is just too complicated to get Nate and Primo in and out of Alaska. 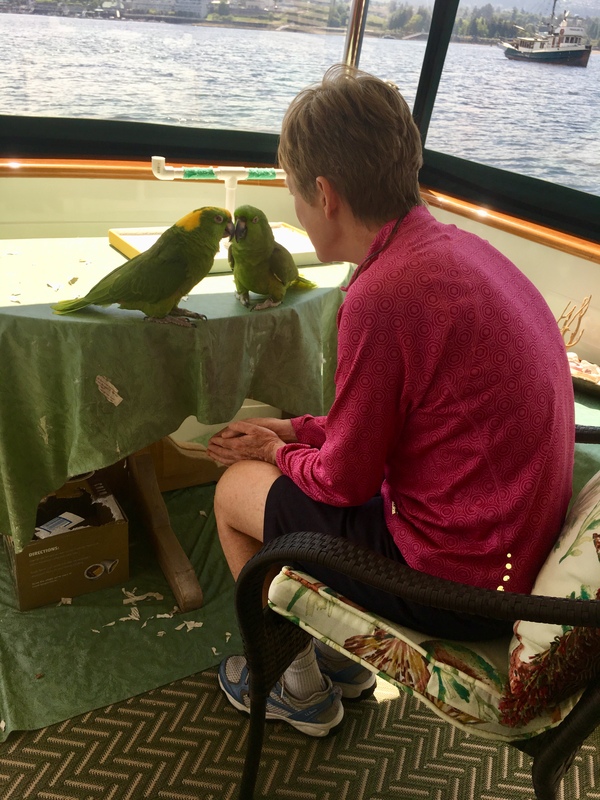 Diana and Kip operate the Two Crazy Birdie Hotel at their home in Nanaimo. Nate and Primo stayed there last year for a few weeks and seemed to enjoy it. 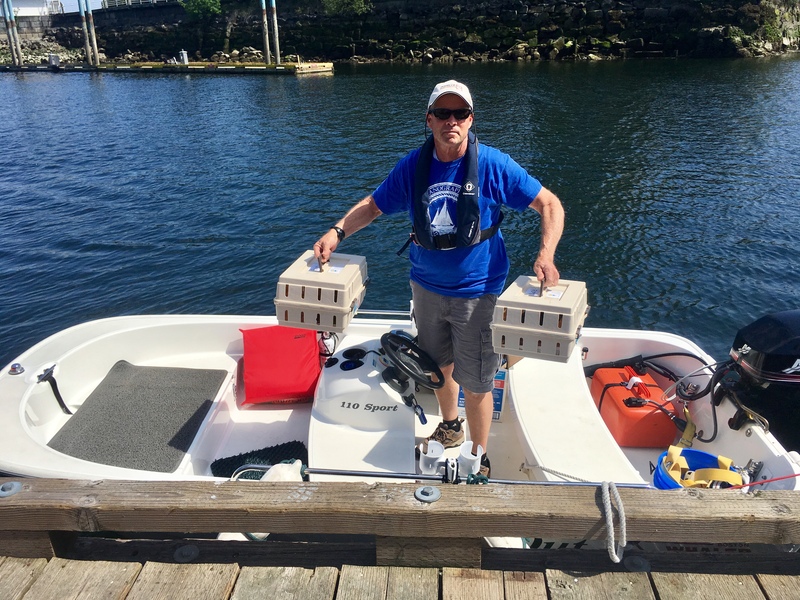 We dinghy over to the town docks in Nanaimo with the two birds in their travel boxes where Kip meets us. It is so hard for us to leave them for three months but we know they are in good hands. We will miss the boys! The anchor was up at 6 am this morning for our long passage up the Strait of Georgia. We call Winchelsa Control to see if the military torpedo range Whiskey Golf is active today. We get some good news. Whiskey Golf is not active so we can continue on a straight route without detouring around the firing range. 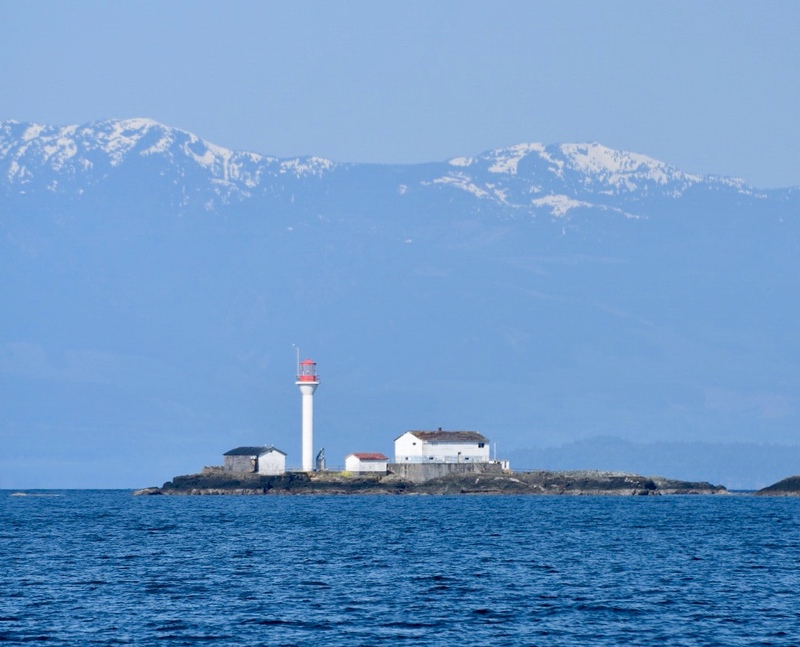 With light winds forecast, we decide to head up the west side of Vancouver Island to Campbell River. 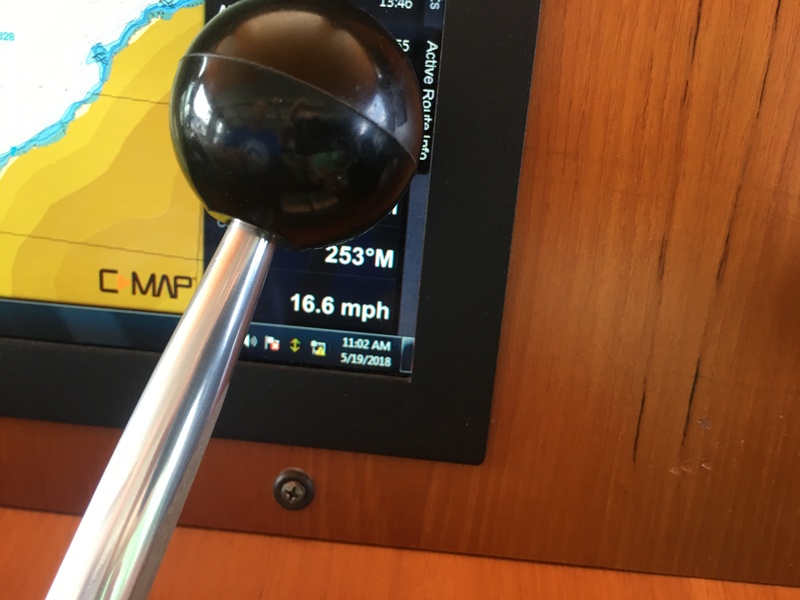 It is a long 90 mile trip but with calm seas all day we enjoy the ride. 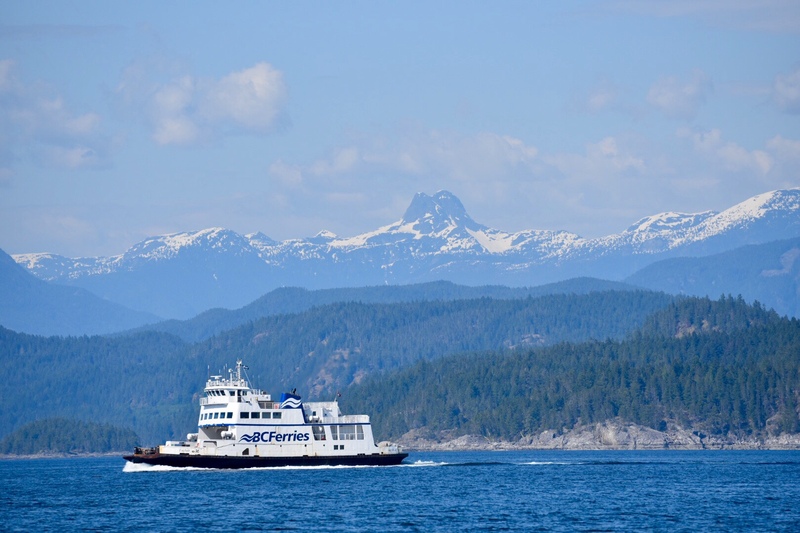 The impressive snow capped mountains along the B.C. mainland provide a beautiful backdrop. 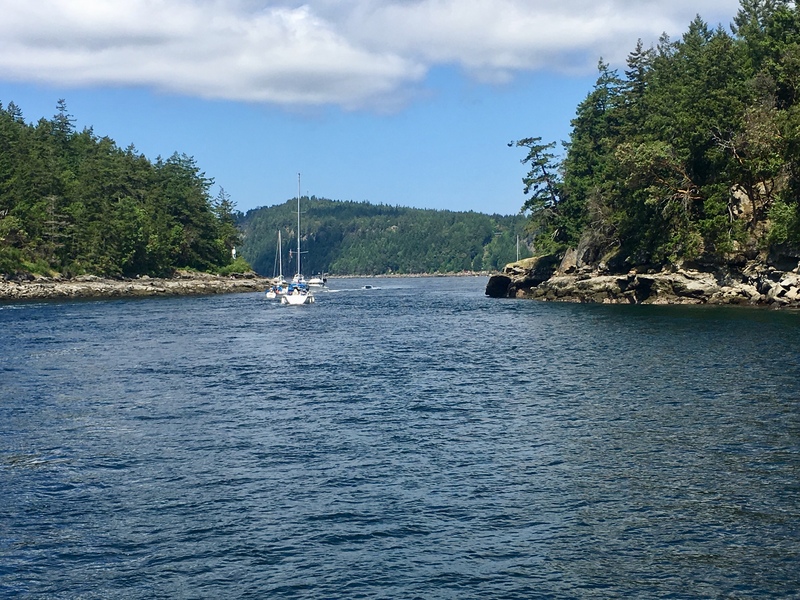 Our original plan was to anchor for the evening across from Campbell Rive and catch the slack at Seymour Narrows tomorrow morning. As we get closer, we check the currents around Cape Mudge to find they will be running six knots against us. It is too much current for us to fight for several hours. After many calculations of slack tides at different rapids both today and tomorrow, we decide to change plans and go through Surge Narrows tonight and anchor in Waiatt Bay. This “back way”route is really our only option. Slack at Surge Narrows is not until 8 pm tonight so we anchor for a few hours in Drew Harbor before heading up Sutil Channel and through the rapids. We will be catching the rapids as they turn to Ebb giving us a push into Waiatt Bay. At 4:30 today they are raging at 11+ knots. We are certainly not doing that. After a very long day the anchor is down at 9 pm just as the sun sets. It is another early start. The Okisollo rapids are just three miles away and must be transited at 7:34 am. They are another one of those 10 + knot rapids that we can only transit at slack. We circle for about 30 minutes waiting on slack and then have an uneventful transit. 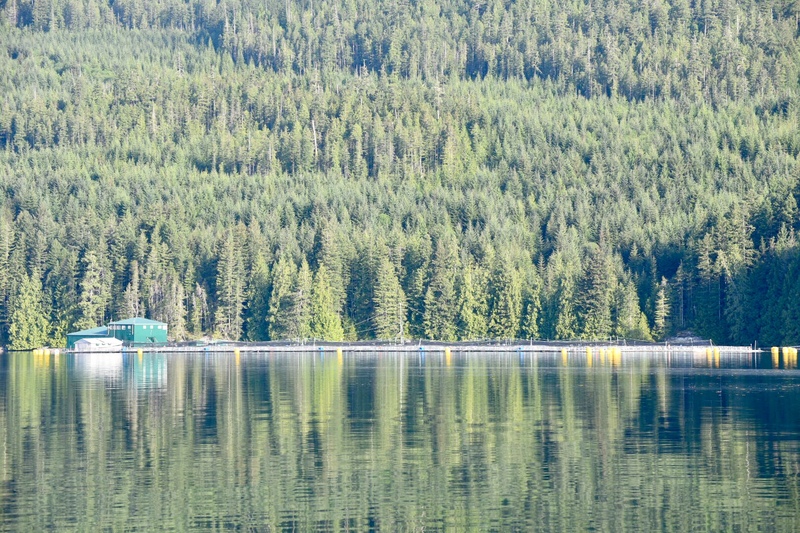 There are several commercial salmon farms set up in the Okisollo Channel. It is strange that they farm Atlantic Salmon here. 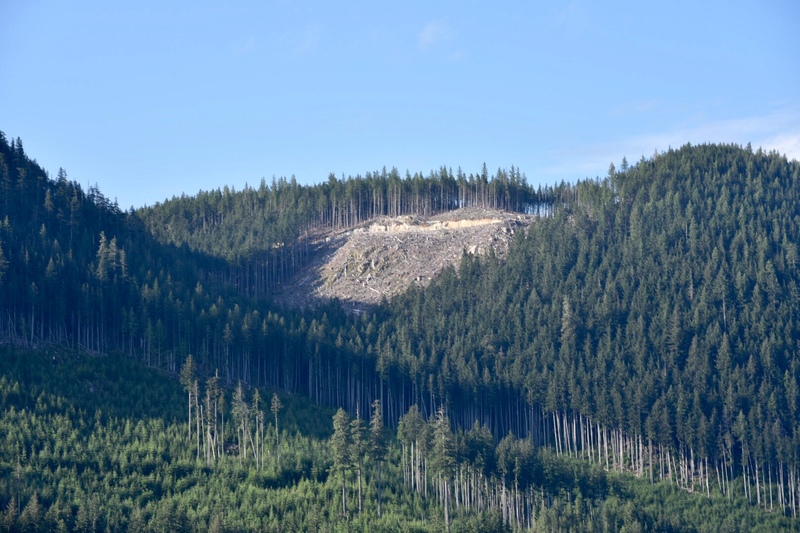 It is also sad to see the logging that is taking place on the mountainsides. 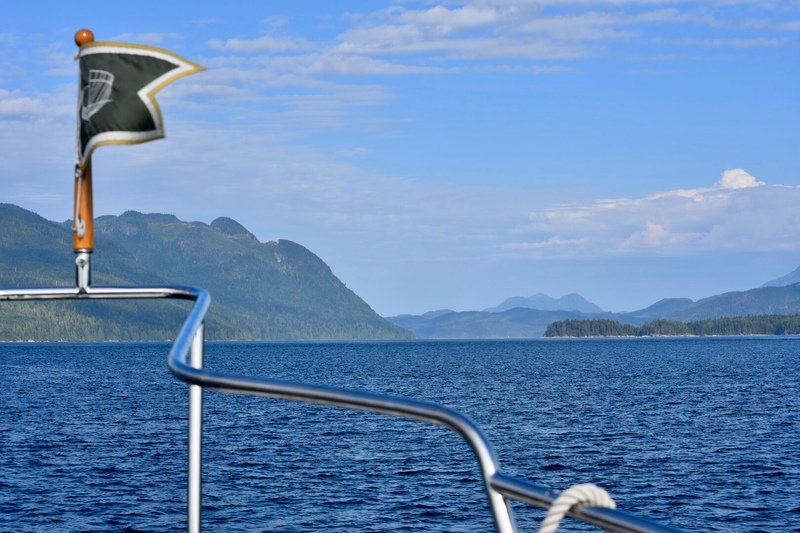 The forecast for Johnstone Strait is a “ strong wind warning”with winds NW building 20-30 this afternoon. This is our fastest route and bypasses several more rapids but it can be ugly in strong NW winds. As we poke our nose out in the Strait we find a light chop with 5-10 knot winds. We have several bail out options so decide to give the Strait a try. As we near race passage it is decision time. We will arrive at this passage at maximum ebb of 5.3 knots of current going with us. It is passable but large whirlpools and eddies form from the tremendous volumes of water moving through the Strait. We are somewhat uncomfortable with running this passage with so much current. We could bail out here and divert but we would have a two hour wait at Whirlpool rapids. Just at the decision time, another boat passes us headed that way. After talking with him on the VHF, we decide to give it a try and follow his route through the turbulent waters. The next three miles are white nuckle and quite exciting. We may have broken a new sped record for Krogens at 16.5 mph. We are happy to have traversed this today but not sure we would do it again. Next time we will wait for less current. After the rapids, we start to calm down and everything seemed good. A routine engine room check quickly changed all this. Our water pump on the main engine has developed a small oil leak. This is a brand new pump only three months old. We quickly change our plans and head towards the docks at Port Harvey. Once docked, we make several phone calls to mechanics. We now have a mechanic lined up for tomorrow in Port McNeill to investigate. 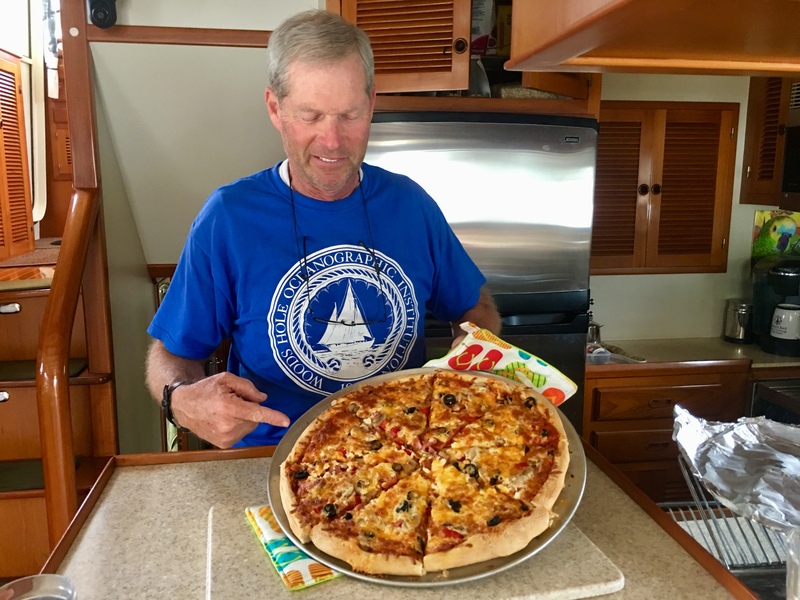 George the marina operator delivered one of his famous homemade pizzas to our boat this evening. A good ending to the exciting day. It is foggy this morning as we work our way out into Johnstone Strait. We are happy to find calm seas with a light breeze. 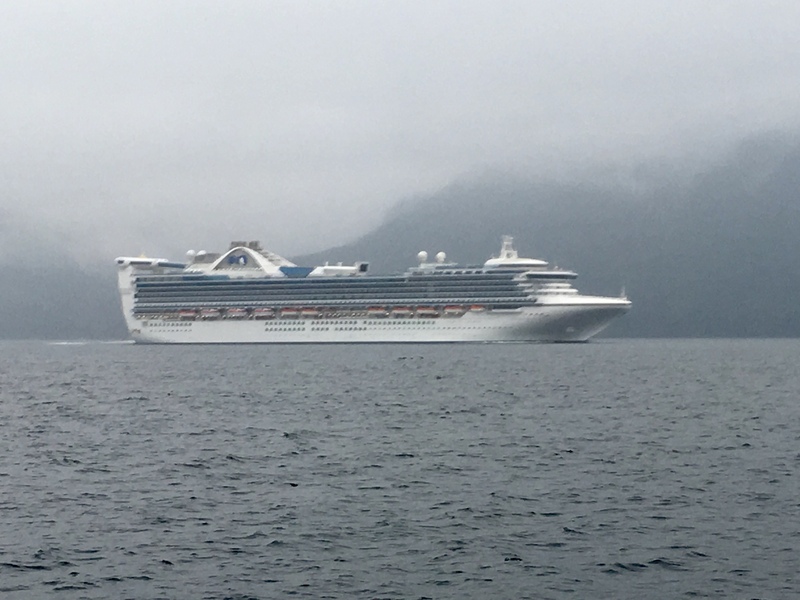 The Golden Princess Cruise Ship soon passes on our port. Our water pump is still leaking a small amount of oil. We do have a spare pump but will let the mechanic in Port McNeil decide if it needs changing. A ten boat flotilla to Alaska led by the Wagoner Cruising Guides came into the docks just after we arrived. Several of their boats are having mechanical troubles also and the same mechanic that is coming to our boat is also working on their boats. Jeff and the mechanic decide to change out our leaking water pump this afternoon. We needed some gasket material and all the stores are closed for a holiday. 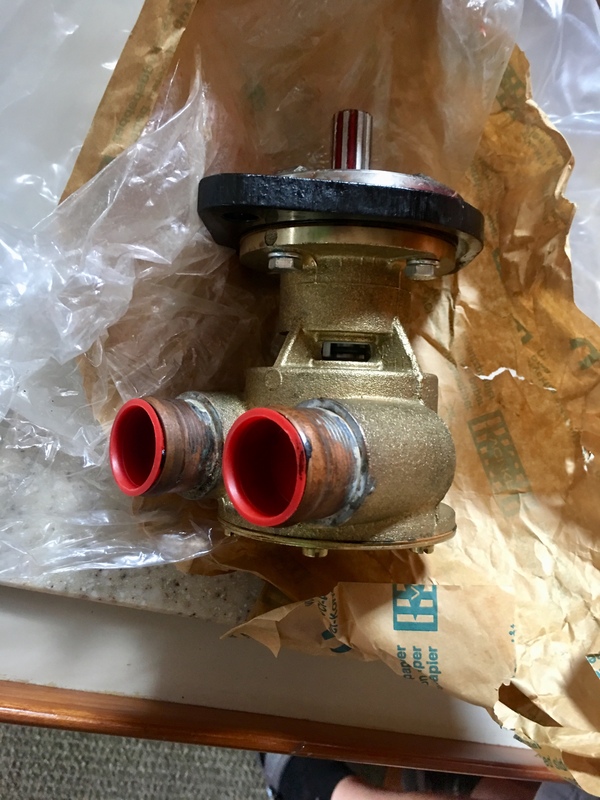 The marina manager had a key to the hardware store so he opened it so we could get the needed parts. You have to like these small Canadian towns. We hope to cross Cape Caution in the next day or two. It is a 90 mile open water passage from here that can get ugly if the conditions aren’t right. We think tomorrow might be the day. The Wagoner flotilla is crossing tomorrow also. We will check the weather at 4am and make a decision. Hopefully Mother Nature will look out for us and we will have a good crossing. This entry was posted on May 21, 2018 at 2:33 am. You can follow any responses to this entry through the RSS 2.0 feed. You can leave a response, or trackback from your own site.